The higher up your product is listed the more likely it is that customers click-through to your product detail page. Amazon also highlights the best selling product in a category for even more visibility. Amazon’s Marketplace search is organized around the product detail page which makes it crucial for sellers to optimize their listings for best results when selling on Amazon. 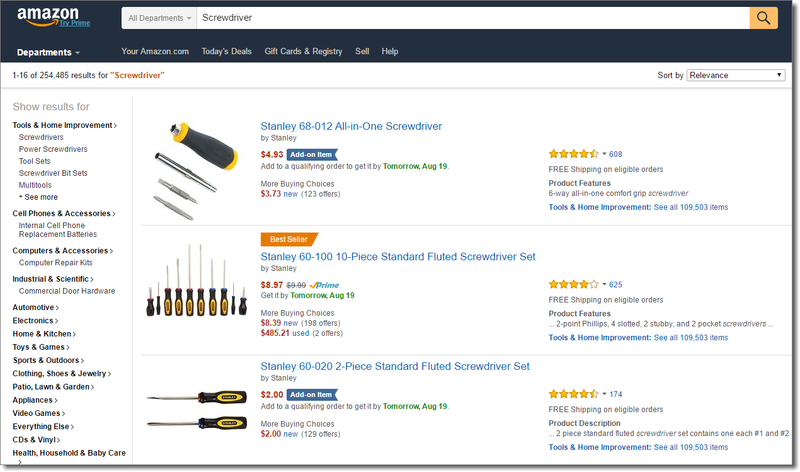 Amazon’s Product Pages are designed to increase the probability of a purchase and based on what Amazon expects will add more value to the consumer like product details and additional products to encourage cross-sales. Title: Main title for the product, same as on the search page (e.g. Stanley 60-100 10-Piece Standard Fluted Screwdriver Set). Brand: Brand name (e.g. Stanley). Image selection: Showcases up to 9 product images. Primary image: Default image and thumbnail for the search page. Product rating stars: Average user review rating for the product (not the seller). Price & Shipping Info: Price and information about shipping (e.g. Free shipping on orders over a certain price). Availability: Shows if a product is in stock, sold out or the number of available products left if 20 or less are left in stock. Seller and shipping method: Indicates who sells and ships the product. This is either Merchant-fulfilled, Amazon FBA or shipped and sold by Amazon. Product specific options: The selectable options can include: color, quantity, size, different model or material. When shoppers select a variation on the parent product page, they get lead to a new product page for the specific variation. Other sellers: All Sellers who did not make it in the buy box are grouped together here. 14. Other Sellers box: This box below the main buy box features additional sellers who sell the main product featured. These are less likely to sell the product than the one who is featured in the buy box. When scrolling down below the fold, Amazon is showing additional information to encourage customers to purchase more products. 15. 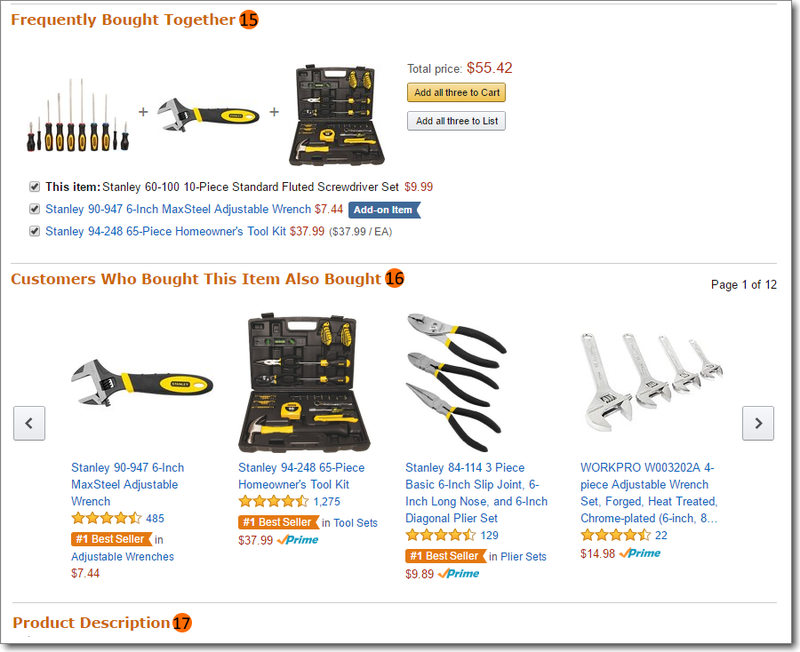 Frequently Bought Together: Amazon presents the customer related products which can be added to the cart together and Add-on Items, low-priced products which are not sold as a standalone product. (e.g. The seller has the chance to sell more products if he has products that are related to one another). 16. Customers Who Bought This Item Also Bought: Like 15. but with more products and without the buy button at the product. Customers have to click on the products to buy them. 17. Product Description: This section expands on the information of the product features bullet points above. 18. Product Details: Product details are showing, Dimensions Weight, Barcodes, Review Rating and Best Sellers Rankings. 19. Related Video Shorts: Related Video Shorts are short videos from a few seconds to a couple of minutes long, but are usually around 1-2 minutes length. They show how products are used or give other helpful tips. 20. Important Information: This is another field available in some categories and can be edited by the seller. 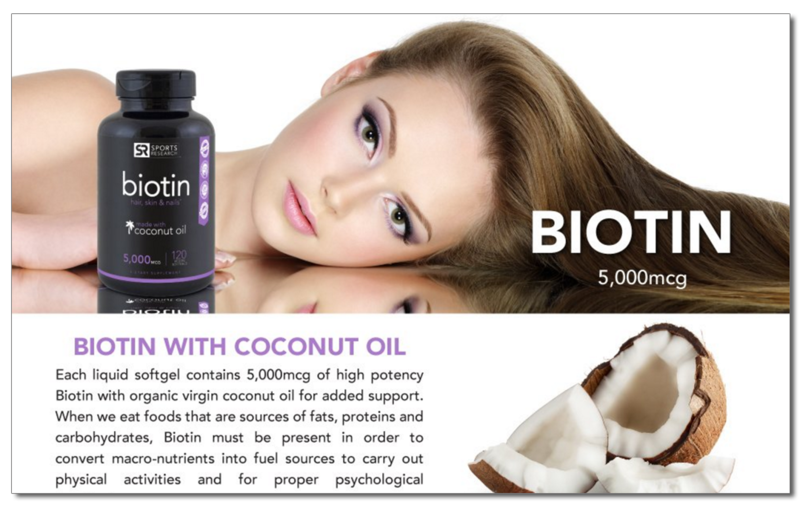 It can be used to give directions how to use the product, Safety Information, List of Ingredients and a legal disclaimer. 21. Related Sponsored Products: Related Sponsored Products is ad space, competitors advertising related products with Amazon Sponsored Product ads will show up here. 22. 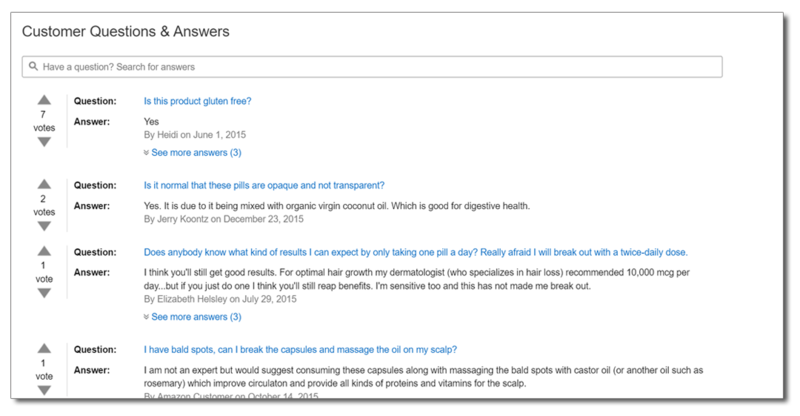 Customer Questions & Answers: The FAQ section is a place where customers and potential buyers can ask questions. Those can be answered by the seller (which you should always do as a seller) or by other Amazon shoppers. 23. Special Offers & Product Promotions: Here is the place where promotions will show up that you want to display on your detail page. It can be used for cross-selling other products by offering discounts or for quantity discounts or special offers (e.g. Buy 2, Get 1 Free). 24. Customers who viewed this item also viewed: This section tell you about what other shoppers are looking at when browsing this listing. It’s a great place for private label sellers and brands to get new product ideas. 25. Your recently viewed items: Your personal browsing history. It allows you easily to jump back to items you were previously looking at. 26. Reviews: Finally there are the reviews. Separated into different sections with a rating summary, Top customer reviews (sorted based on helpful/unhelpful votes), customer images and most recent reviews. Here you can learn more about how to get Amazon Reviews. Sellers and brands should pay close attention to customers reviews, to address concerns and problems with the products they’re selling either by making changes to the product, or by changing the copy on the listing. In some categories Amazon is using a different kind of design instead of the standard layout. Examples include Beauty Products, Health & Personal Care and others. Another difference is the use of structured content showing materials and information about the manufacturer, in some categories you might come across technical details in place of the bullet points. In order to make it easier for sellers to keep track of the various different designs and different rules as well, Amazon created guidelines for seller, the so called category style guides. Like this style guide for Home & Garden. You can easily find the right style guide for your category by searching for [category name] + style guide in the help section of your seller central account. 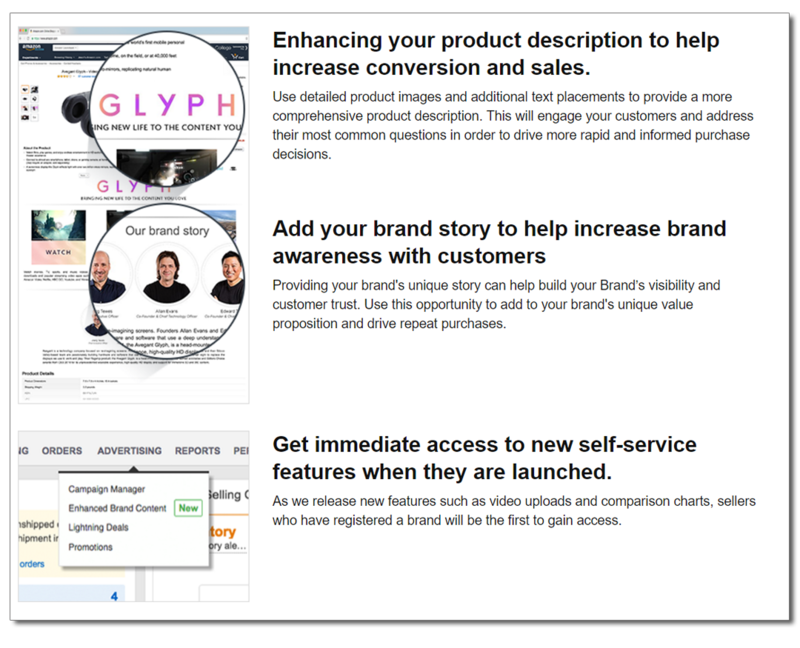 As you can see, these product detail pages put more emphasis on the images and brand, rather than the copy, making optimizing your images an even larger priority than before. A+ Detail Pages allow brands to display their products with enhanced content, such as multiple images and text fields in the description structured by HTML. The following is an example of a beauty product with A+ Description. Currently only sellers using Amazon Vendor Central and Amazon Vendor Express are eligible for A+ detail pages. A+ content is a great way to provide more information, benefits, features and images to potential buyers. It has shown to increase conversion rates significantly, compared to the simple unstyled product descriptions. If you are an Amazon Vendor this is one of the great benefits compared to 3rd party sellers. Some of you may have noticed a new addition in the advertising section of your seller central account, called Enhanced Brand Content. What this does is giving brand registered with Amazon Brand Registry access to styled pages similar to A+ Listings. You can choose from different layouts and tell more about the brand and story behind it. While there are similarities and elements that are the same across all categories in Amazon. There are also different rules and style guides for many of them. Layouts and rules are not set in stone either and can change at any time. Therefore as a seller it’s important to keep up to date with the categories you’re selling in, not only in order to stay compliant with Amazon’s Terms of Service, but also to optimize based on the unique requirements of your category and utilizing all the fields available to you, as well as enhanced content and A+ detail pages at their full potential to increase sales and conversions. If this is something you’re struggling with, we’re happy to help you optimize your brand’s presentation on Amazon and help you create outstanding images and copy.